I made a delicious lunch today. Sunday is the one day of the week that Steve and I share as a day off. Of course, he was a grumpbump when I woke him up to eat lunch. I made ham and green beans and homemade mashed potatoes. I was feeling pretty good, thanks to my three glasses of Sangria I downed while cooking. It has rained most of the day, but I was good enough to get my weekly shopping done early today, so I could enjoy the afternoon. However, I did not plan accordingly and ended up at Publix. I spent $100 for a week's worth of groceries. I paid more because I determined it was too inconvenient to go to Aldi's, which is further away from me. Even though I am working again, and perhaps Publix is now in my budget, I really appreciate that Aldi's can save me so much money. You have no idea how much my hands ache. I finally finished my baby blanket today, with minutes to spare. I had to knit for 5 hours straight to complete it. The finished product was about 35 inches long (I was shooting for 36). 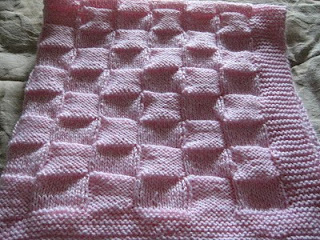 This picture shows the blanket folded over (with a close up of the basket weave pattern). The following picture shows the entire blanket as laid out on the bed. 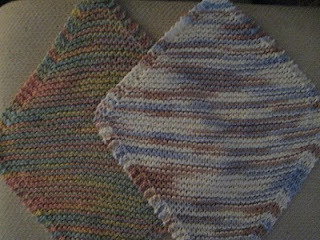 In a perfect world, I would have blocked it so the edges were straight, but when you get the finished product off your needles at 12:45 p.m., and the baby shower starts at 2:00 p.m., there is no option but to just wrap it up. As luck would have it, my gift was the last one opened at the shower. When the mother-to-be unwrapped it, I got emotional because this is my first true knitted gift and it was for such a wonderful woman and the baby she always dreamed about. When she held it up, I was surprised by how nice it really looked (close up I can see all of my mistakes). I started working on the baby blanket on Sunday. I allocated at least two hours every night for it; knowing that I had to have it done by Saturday. I'm behind schedule but I don't have to work tomorrow and I plan to have most of it done by tomorrow. The baby shower is not until 2:00 p.m. on Saturday, so if I need it, I can use Saturday morning to finish it. It's a bit of a simple blanket and it's definitely for a Florida summer baby because the yarn is thin. 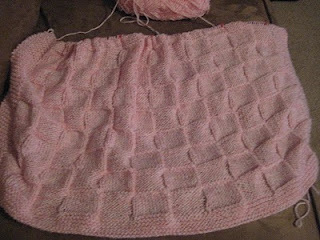 I'm using Bernat Softee Baby in Baby Pink Marl. The yarn is very soft and it's a really cute pink color.